Call us� our price on this item will not be beaten. 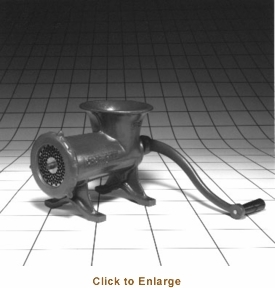 You�re viewing our Chop-Rite #22 screw down chopper and meat grinder. The manual screw down #22 chopper and meat grinder is used to chop meat, chicken bones and vegetables, and is used for chumming. This small hand operated chopper and meat grinder can be screwed or bolted to a countertop or tabletop. Made of durable cast iron construction. Comes with the following: cylinder, feed screw, ring, crank, stud and washer (1/2-13 thread), knife, 3/16" plate that is 3-1/4" in diameter. Throat opening is 4-1/4" x 5- 1/4". Easy to clean. Made in the USA. 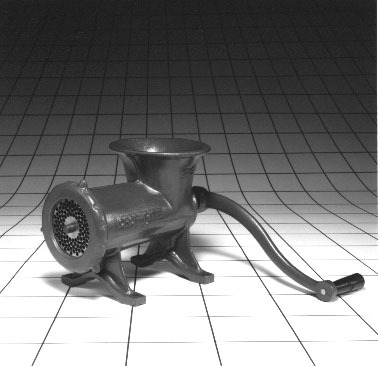 Our manual chopper and meat grinder comes with a manufacturer warranty. Please contact us with any questions you may have about our products. Scroll down to view our Chop-Rite #22 screw down chopper and meat grinder.